After our very chilly night, Chandler and I popped out of bed the moment the alarm went off. 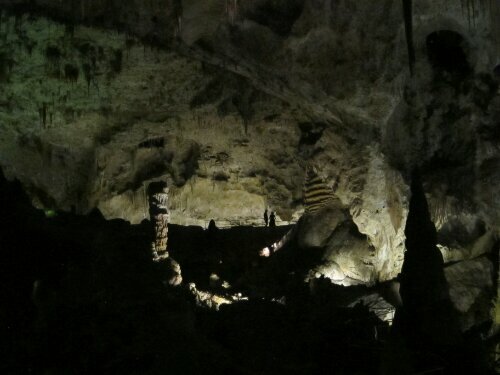 We wanted to get to the Carlsbad Caverns in time for the lower cave tour and still had several hours of driving to ahead of us. The driving was uneventful but entertaining thanks to a few “This American Life” podcasts. 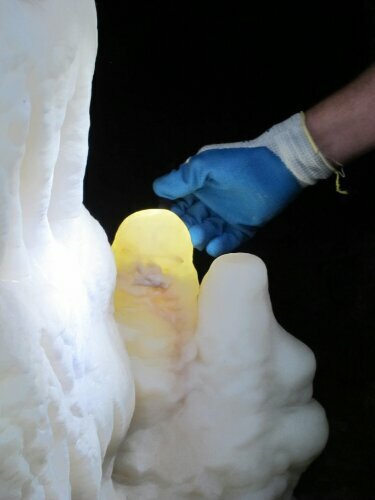 We made it to the park at 11:40, which gave us time to kennel Lucy and check out the self-guided upper cave tour. The Caverns has a cheap kennel service for animals if it is going to be over 75F so people don’t leave their pets in the car. So awesome, Lucy loves AC! 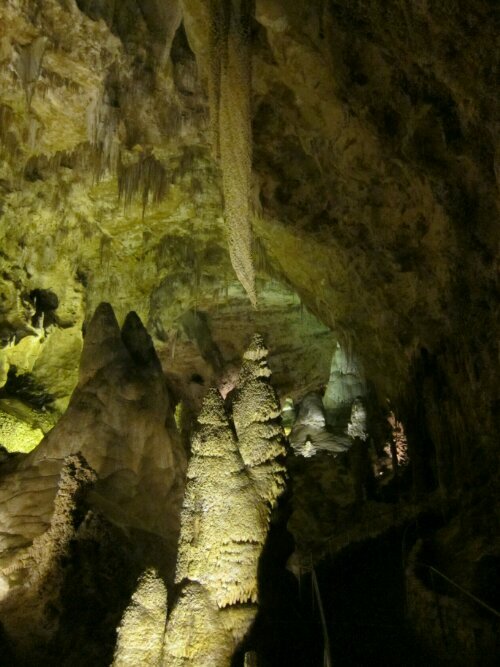 The self-guided tour began with a quick elevator ride down 750ft to the upper cave. 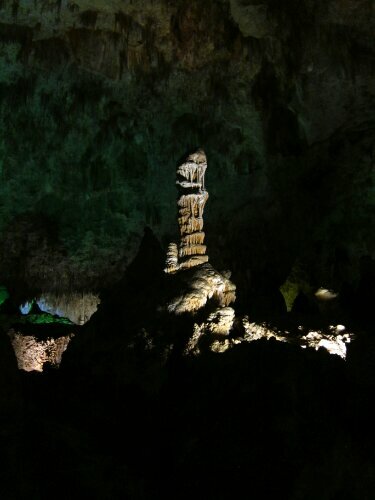 There was a designated concrete footpath around the cave with specific features illuminated. We only had 35 minutes to look around before we had to get back for the tour. When we signed up for the lower cave tour we didn’t really know what would be happening except that ropes and ladders were involved. We met up with our group only to discover there were more park employees than tourists and would have a nice small group. We were given gloves, hard hats with lights and rules about safety and touching cave formations. 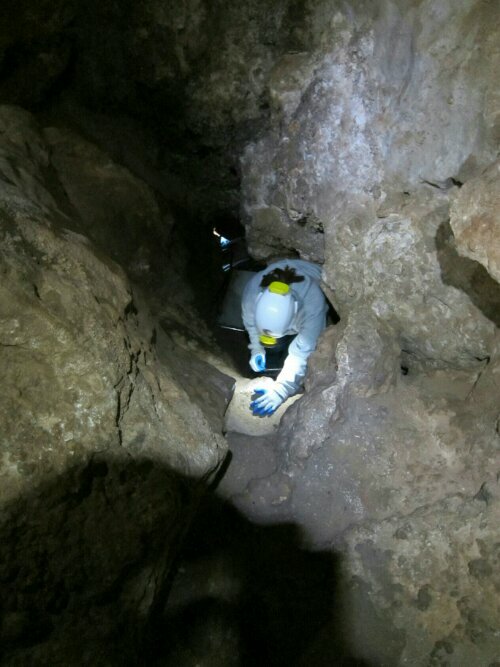 The entrance to the lower cave was a small hole at the bottom of a pit in the upper cave. We had actually walked by it on our self-guided tour completely unaware of it. Everyone walked down a slippery slope, aided by a rope, to reach the hole. We descended a series of three ladders down an additional 100ft. 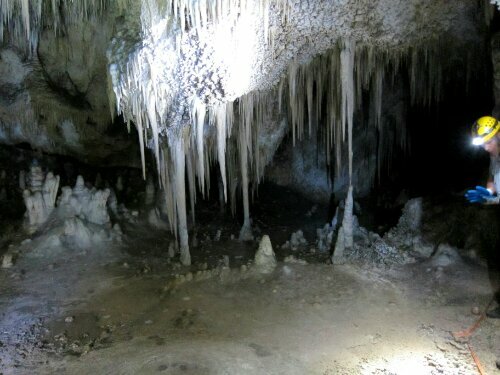 Once everyone was down the ladders, we were led around the cave and shown interesting features. Normally, the guide just spouts off memorized facts, but the guy we had was amazing. He has his master’s degree in geology and really knew his stuff and our questions weren’t brushed aside with bs answers. 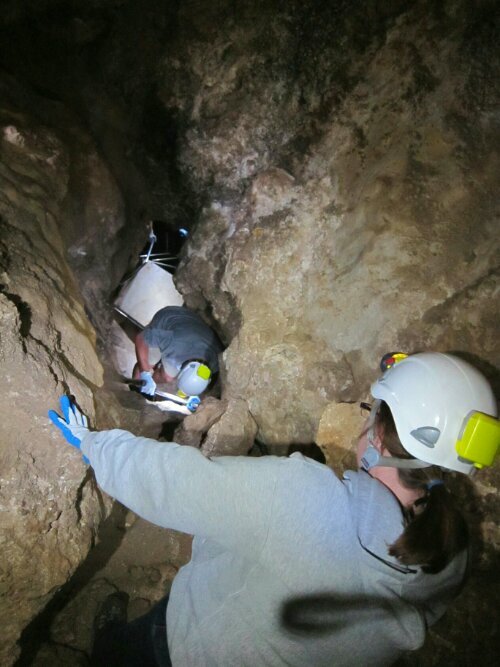 Since our group was so small, and we hadn’t smashed any ancient cave formations, the lead ranger asked us if we wanted to take the longer route out of the cave. This was exciting because we were able to go a more challenging route that was a lot tighter than the normal trail and also had a lot of delicate features much closer to the path. 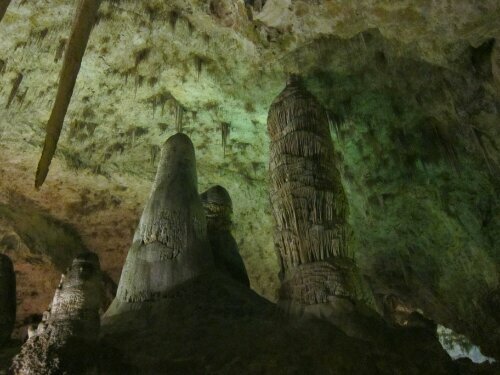 The tour went an extra 30 minutes so the rest of the caves were closed when we got done. Chandler collected the dog and I took care of our gear. Our next stop was Austin, TX to visit my brother and his wife. We didn’t quite realize how far away Austin was from the caverns, so we decided to drive a few hours to shave off some time. Mexican food was in order again and we found a busy and sketchy looking place in Pecos,TX. The moment we walked in the door it was obvious we weren’t from around there. Almost everyone had cowboy boots, one guy even had spurs, and cowboy hats. The food was good and everyone was very friendly. Chandler had a steak covered with a “long green chile” which was cut open and roasted. I had a chile rellenos. Again, it was too dark to find a suitable place to camp so we stayed at the Walmart of Fort Stockton, Texas. We spent a few hours with Alexis and her boys in the morning before leaving for New Mexico. The boys made sure Lucy was included in all the fun. Neither Chan or I have been to the southern part of the US east of Arizona, except for Florida, so we’ll be traveling through new territory for a while, which is exciting. Chandler and I had two goals for the day. Find good Mexican food and get to White Sands National Monument. We have noticed that the crappier a place looks, the better the Mexican food. The place we found in Las Cruces was no exception to the rule. The only thing on the menu was gordita, which for the uninitiated are pita-like pockets of fried cornmeal stuffed with typical Mexican things. We each had three, they were incredible. On the way out of town, Chandler noticed a display on the side of the road. We knew that White Sands is occasionally closed due to missile testing, so we weren’t too surprised to see one on display. This was the Nike Hercules missile, an anti-aircraft/anti-ballistic missile from the Cold War era. There is an old Nike station outside of Anchorage, on top of a mountain near a local ski area so it was interesting to see a full sized missile up close. We made it to White Sands about an hour before sunset and met the grumpiest park ranger ever. After Surly Sally (name changed to protect the grumpy) informed us we had to have our tent set up before the sun went down, we had to hustle to get going. In our haste, we didn’t think about how cold the desert is at night. We grabbed our summer sleeping bags and Chan decided to not bring a sleeping pad since sand is so soft. The hike to our designated camp site fun. We walked up and down sand dunes as the sun set. 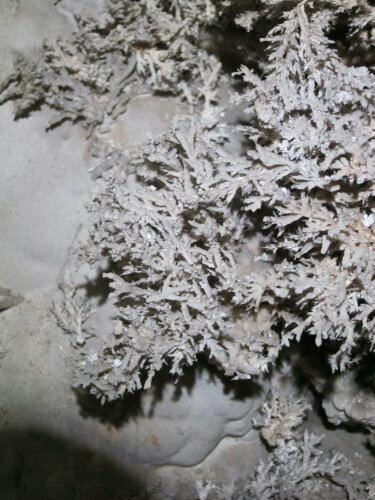 We joked about mining spice, sandworms and the interesting looking plants growing out of the dunes. After setting up camp it began to get a little cooler. Chan experimented with taking long exposure photos and it got colder. Soon it was cold enough to want to just hang out in the sleeping bags and work on the blog for a bit. The sand on the dunes was super fine and dry which made it feel very soft like fresh powder snow. The sand around our campsite was down in a valley below the dune peaks, and lots of concentrated foot traffic packed the sand like concrete. Sleeping was difficult with our thin bags. At one point, Chan asked if we could share my sleeping pad because he was so cold. I gave him the dog instead as sharing didn’t work so well. I think we each got about 2 hours of sleep total and were happy when the alarm went off at 6am. We bolted the mile back to the car in the dawn light and blasted the heater. The thermometer read 26F. We were experiencing the true extremes of the desert climate first hand, and we didn’t like it. After an inadvertent tour of Alamogordo in search of coffee (failure) we climbed one of the largest hills in a while to the town of Cloudcroft.